LAS VEGAS – In the closing laps of Saturday’s Boyd Gaming 300 NASCAR Nationwide Series race at Las Vegas Motor Speedway, Kyle Busch was close enough to make Brad Keselowski uncomfortable. It didn’t help that Keselowski’s engine sputtered when the voltage in his battery dropped dangerously low. But Keselowski built a big enough lead after a restart on Lap 168 of 200 to ward off Busch’s charge in the closing stages of the race. Keselowski’s first win of the season, his first at LVMS and the 28th of his career left Busch, a Las Vegas native, frustrated in his 11th futile attempt to win a Nationwide Series race on home turf. Busch was runner-up for the second straight year and third time overall. “Kyle’s one of the best in the business, and he deserves a win here, and he’s been real close, just like we have,” said Keselowski, who was leading on the final lap in 2011 before a blown tire knocked him back to third. Kyle Larson ran third, followed by Dale Earnhardt Jr. and rookie Chase Elliott. Matt Kenseth, Brian Scott, Trevor Bayne, Chris Buescher and Regan Smith completed the top 10, leaving Smith and Bayne tied for the series points lead. Busch dropped to the rear for the start of the race, because his crew made an unapproved adjustment to the No. 54 Toyota after impound, replacing a frayed alternator belt. By Lap 12, however, Busch had cracked the top 10 and continued to advance through a 56-lap green-flag run to start the race. But Keselowski was dominant during the middle third of the race, and after a restart on Lap 75 — a result of the second caution for Dylan Kwasniewski’s brush with the Turn 3 wall on Lap 70 — he drove away from Busch, who was running second. Busch had a half-second lead when NASCAR called the third caution on Lap 148 because of debris in Turn 2. During pit stops under yellow, Keselowski overshot his pit stall, dropped three positions and restarted fifth on Lap 152, with Busch leading the field to green. Keselowski rocketed into the lead moments after the subsequent restart on Lap 162 and held it the rest of the way. Busch picked the outside lane for that restart and immediately dropped positions to Keselowski and Elliott but didn’t consider that choice a decisive factor. 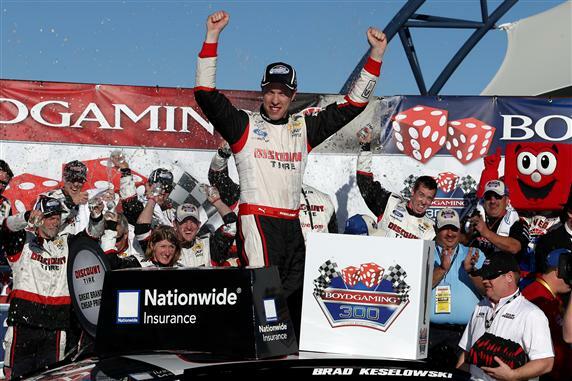 Next Article » Sprint Cup | Keselowski Sweeps Vegas, Beats Dale Jr.